There is always something new – to learn and do. One of the most wonderful things about learning, creating and sharing new things is connecting with other passionate people. head ‘back to class’ to try something new. 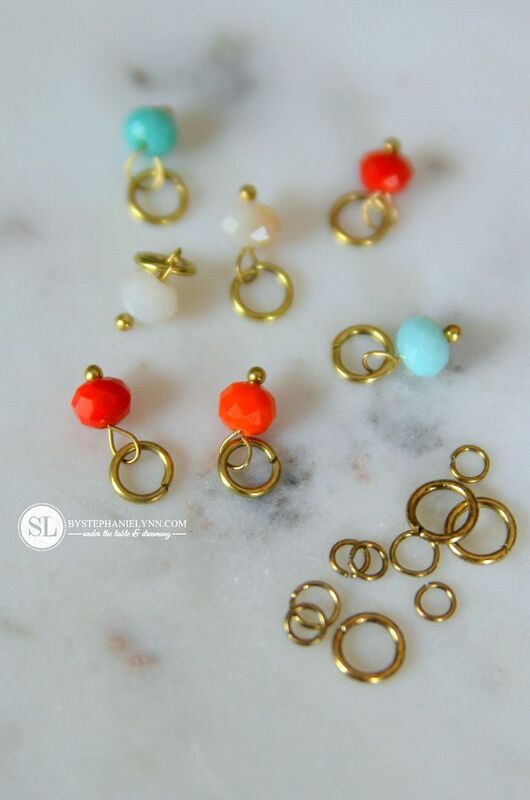 Michaels In-store Classes are the perfect opportunity to set some time aside and plan girls craft night out – so my friend Jen and I registered for a jewelry making class. 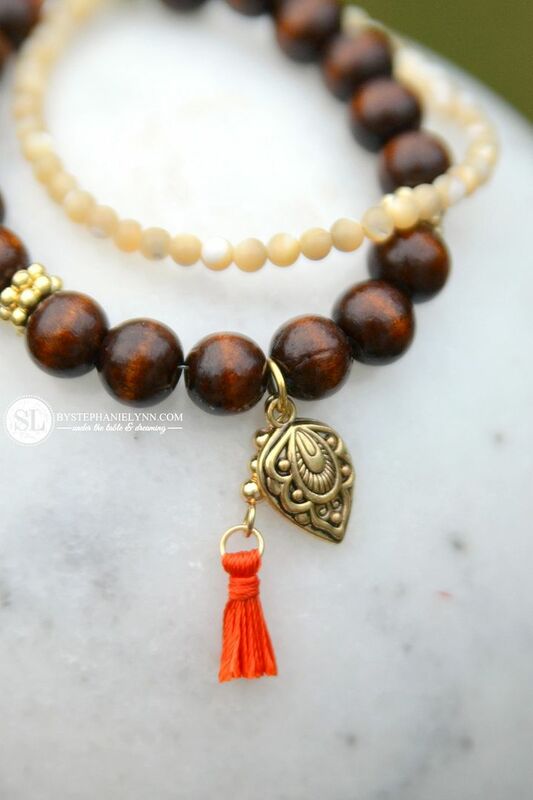 We both made Hasma Hand beaded necklaces for happiness, luck, health and good fortune. The class gave us an amazing overview of some basic tools and key techniques – along with several tips and tricks to get us started. We both loved the excitement and anticipation of diving into something new. Needless to say, we ended the night wandering through the jewelry section with a cart full of goodies and a new fun hobby! 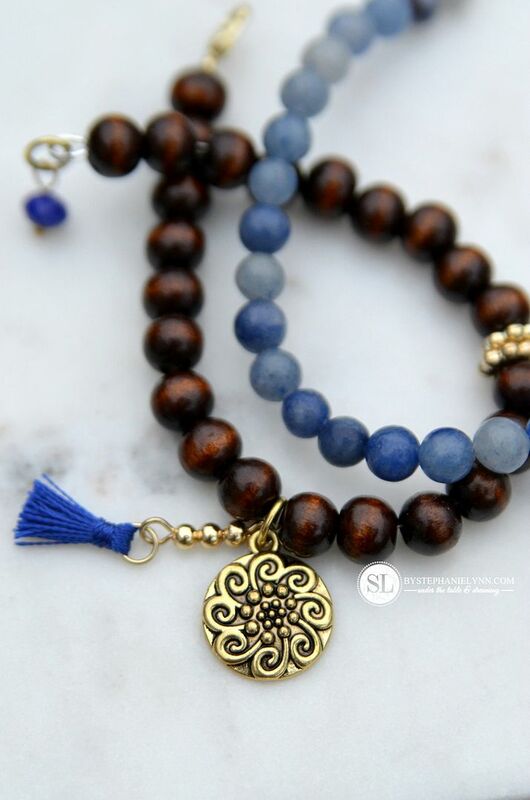 The first project, utilizing my new skills, was a set of Wooden Bead and Tassel Bracelets. 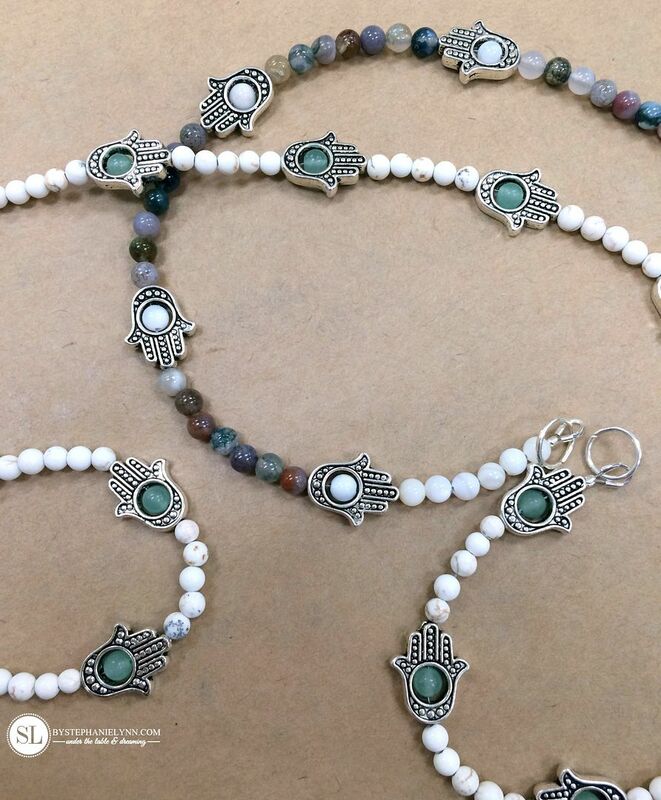 These are simple to create and the basic techniques shown below can be used to make any beaded bracelet combination. 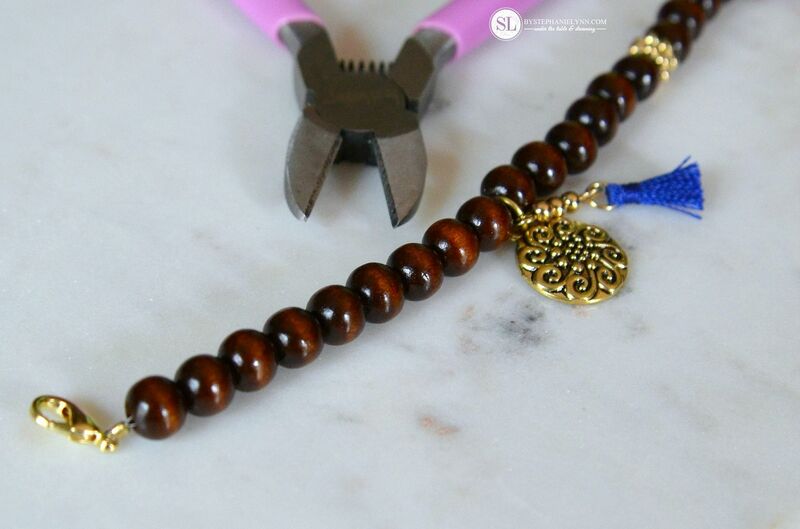 1| Stringing Wire – This Stringing Wire was recommended by our class instructor and is the ideal choice in strength and flexibility for general beaded necklace and bracelet creations. 2| Standard Crimper Tool – Easy to use hand tool that closes and secures crimp beads. 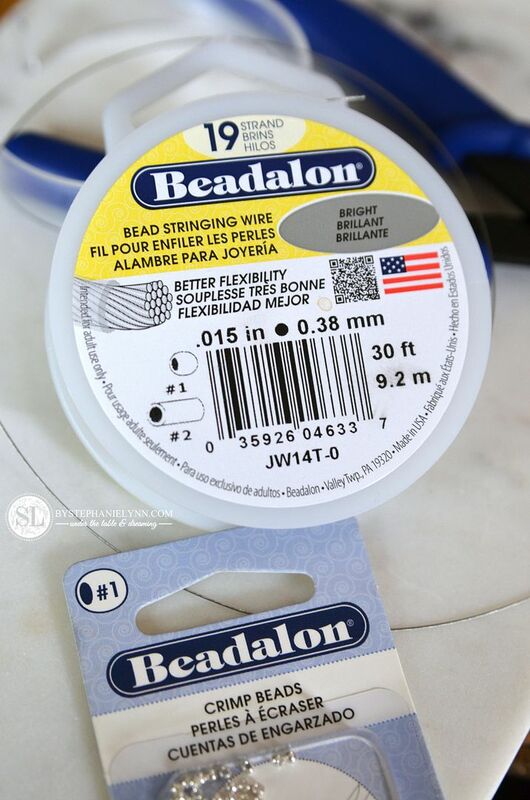 3| Crimp Beads – Crimp Beads are tiny beads that can be ‘crimped’ to secure the ends of the stringing wire. 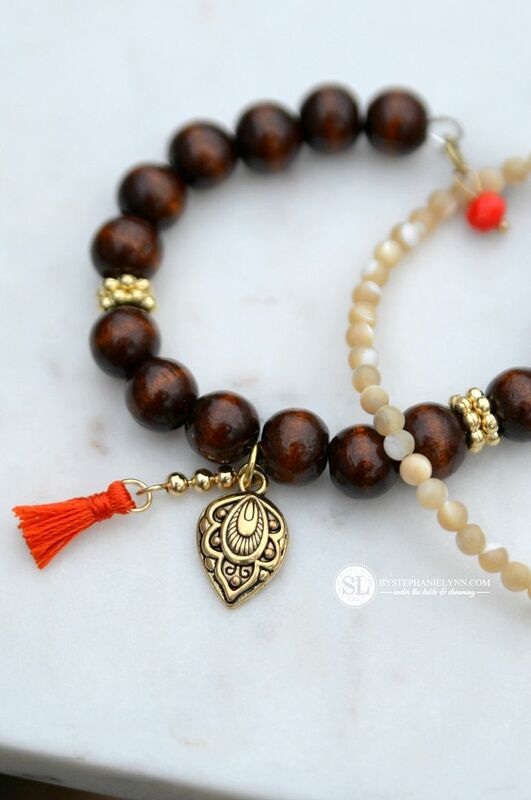 I like to think of them as a knot at each end, holding the entire bead design in place. 4| Wire Guardians – Wire Guardians are optional but highly suggested for a finished look and added security. 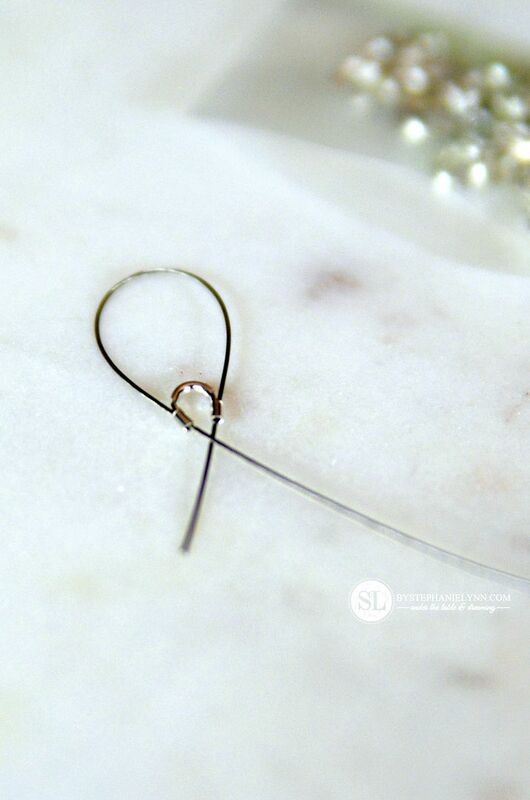 They create an extra, uniformed loop at the end of your deisgn and protect the beading wire from everyday wear or tear. 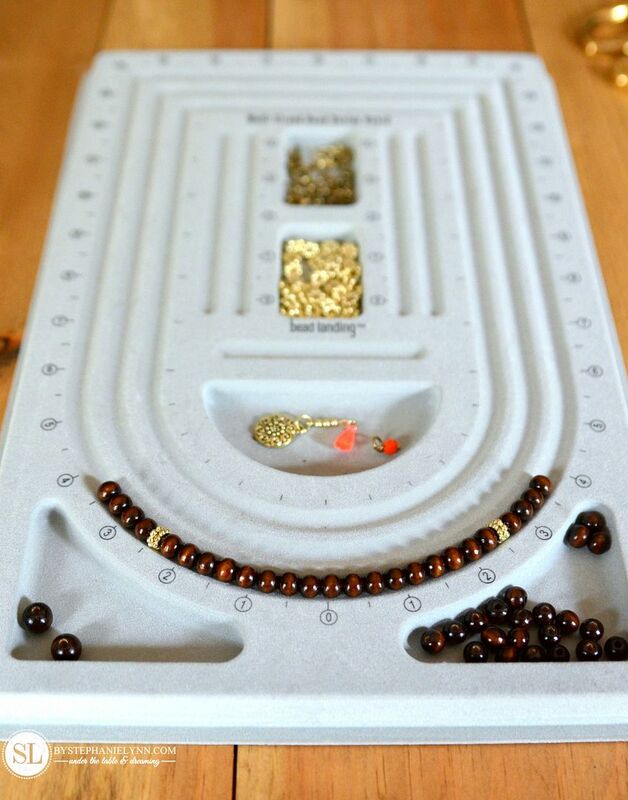 5| Bead Design Board – The Bead Design Board is another optional supply, but highly recommended. 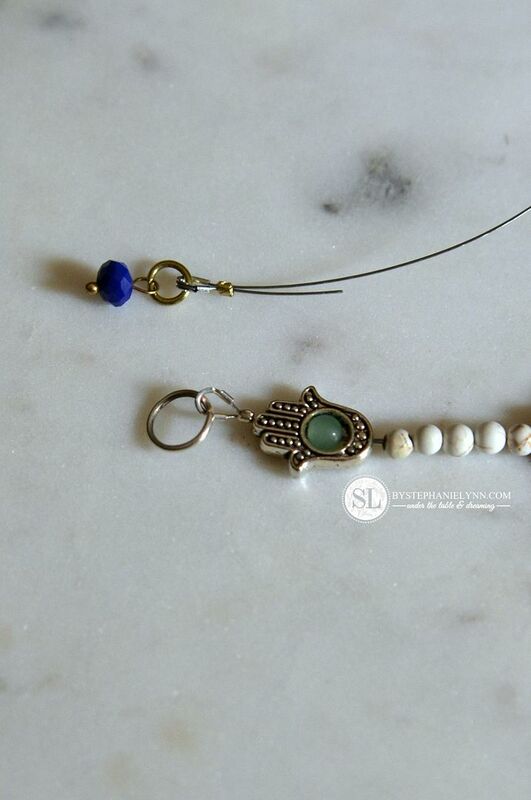 It allows you to easily visualize the lay out of your bead design before you begin stringing. 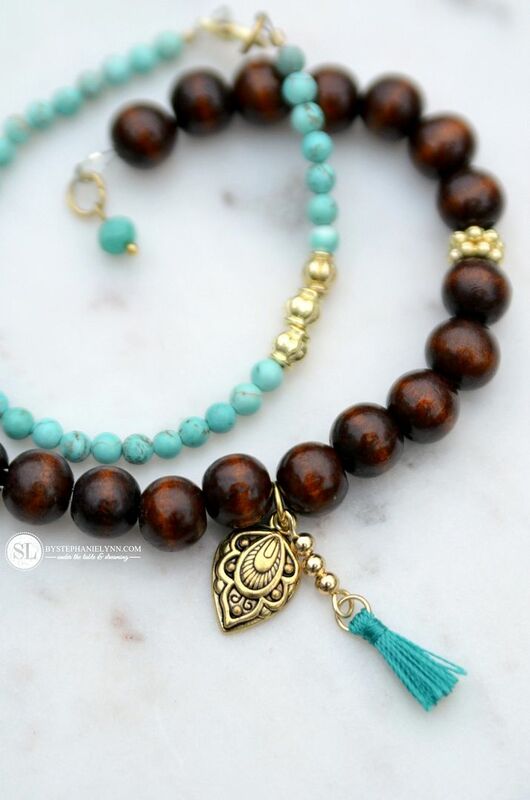 I love the recessed compartments – which help keep all of the beads contained while you are designing. 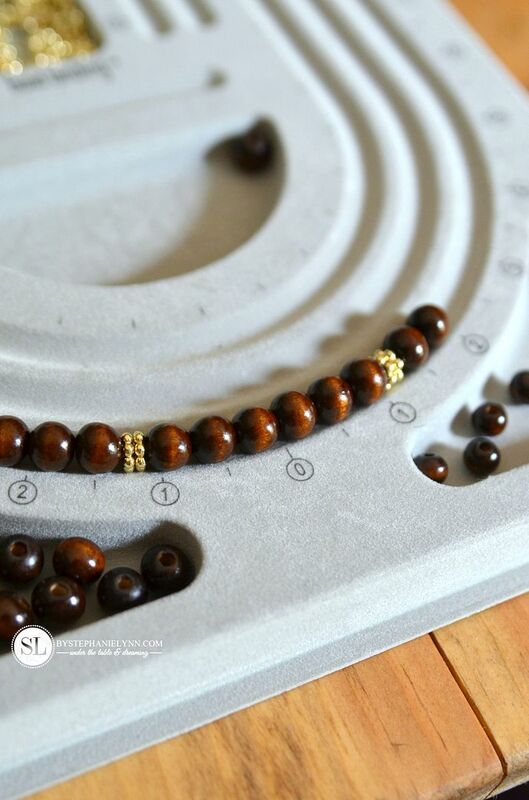 The marked measurements long the beading grooves are the perfect guide for necklace and bracelet lengths and very helpful when spacing out bead designs. The board can also be used to create multi-strand deigns. 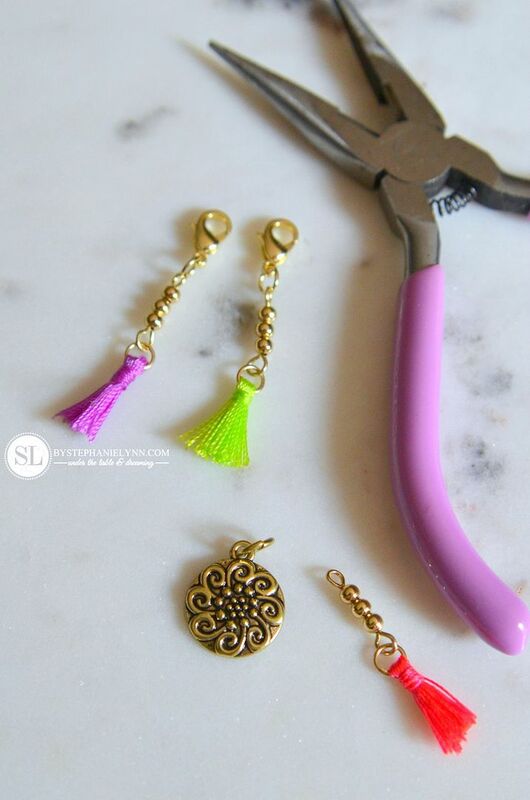 6| Jewelry Tools – Although you can get away with a pair of pliers and wire cutters – it’s a good idea to have a set of dedicated tools designed specifically for your jewelry. This is great beginner set for a really good price. 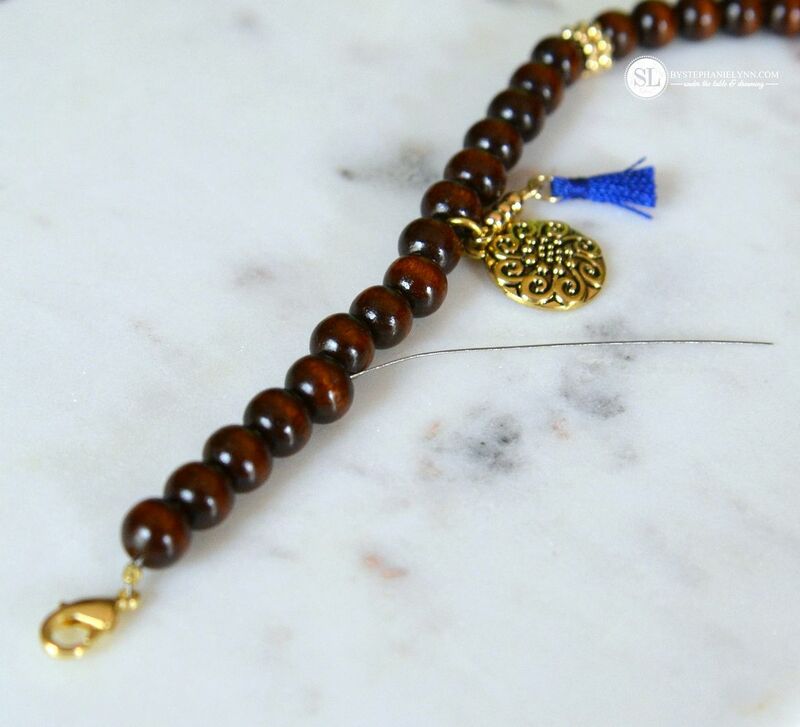 7| Closures – Closures are the mechanisms that allow the necklace or bracelet to easily be put on or taken off. Although there are several different types, that serve different purposes – it mainly comes down to personal preference when choosing a closure. A few of the more popular closures are pictured above. 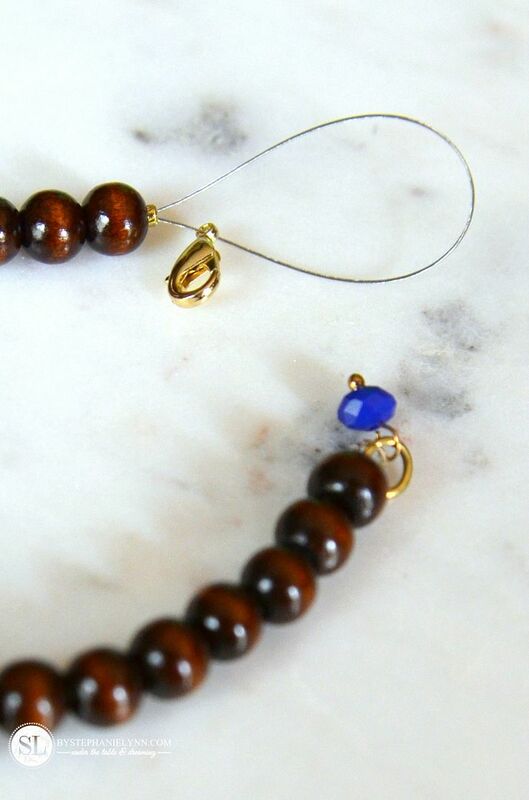 This basic method is a simple, easy and essential technique for any finished beaded bracelet or necklace design. while the other end will be finished with a crimp bead and closure. Step One: Cut Stringing Wire to desired length. 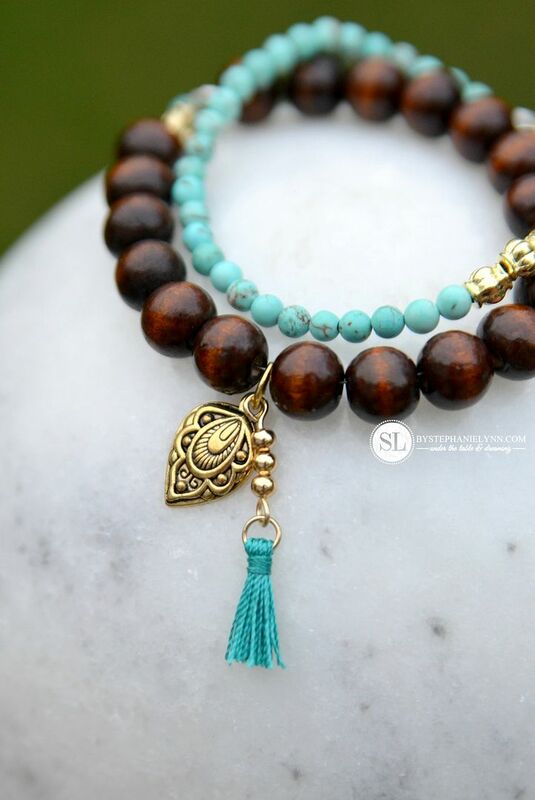 Measure arm for bracelet length and add 6 inches to that number. 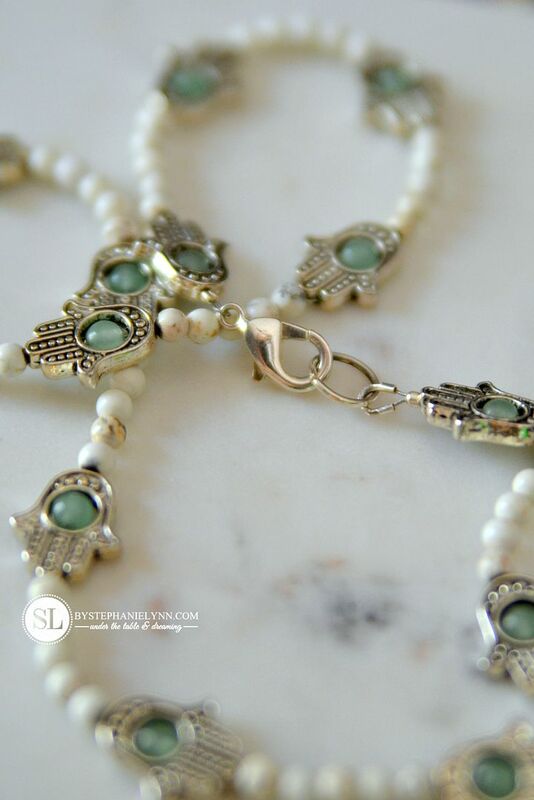 The additional six inches will allow enough room to maneuver the wire when finishing the ends of the bracelet. Step Two: Thread a Wire Guardian onto one end of the wire. Step Three: Slide a Jump Ring through the wire and onto the Wire Guardian. Step Four: Add a Crimp Bead and bind together using the Crimper Tool. 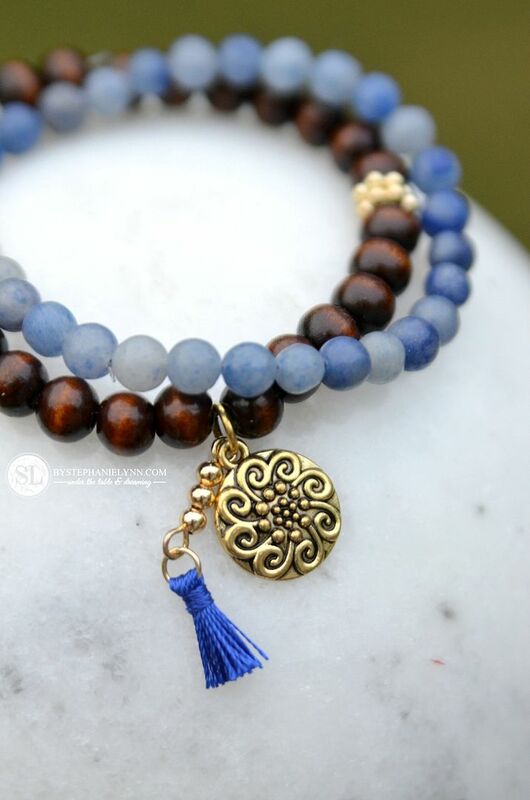 This completes the first end of the bracelet. 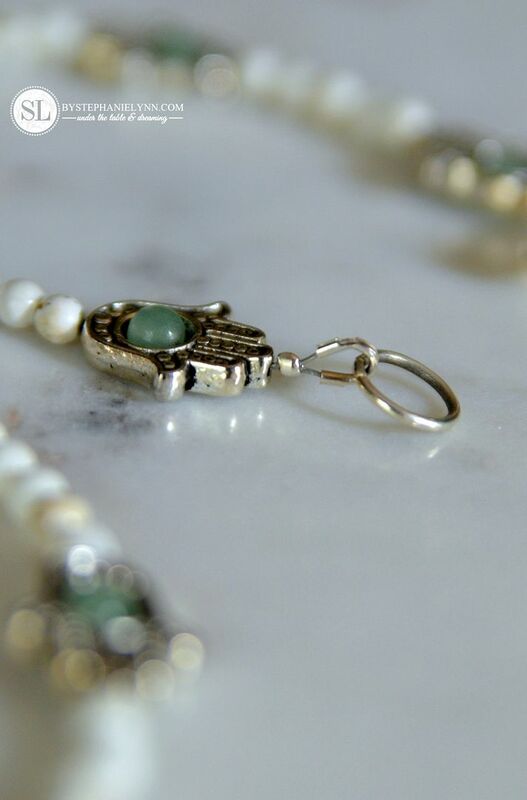 In place of the standard jump rings, I picked up a set of pre-made Bead Landing Charms, in-store, to use. 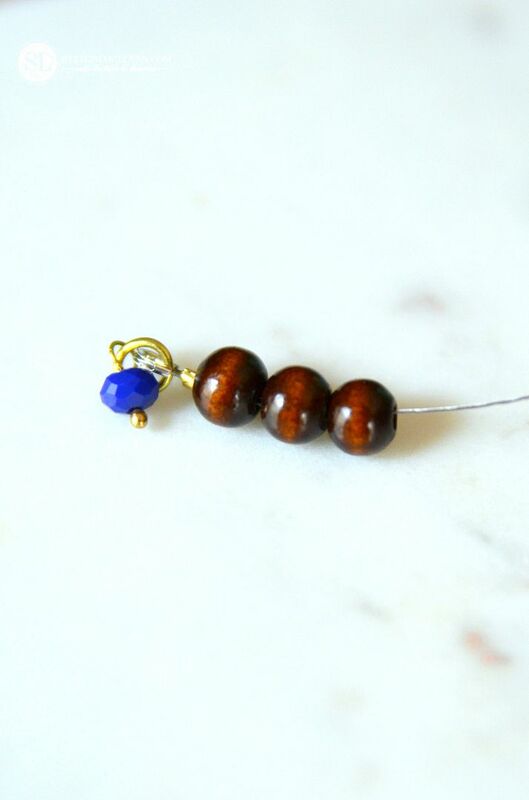 I like the way the drop bead dresses up the closure and adds a touch of unexpected color. Step Five: Begin stringing the beads. 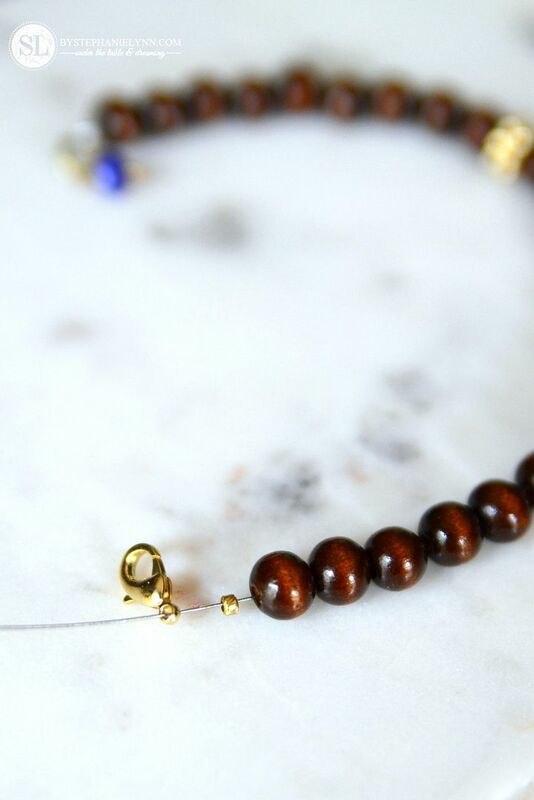 Note: The first couple of beads will be threaded through both the bracelet wire, and the excess ‘tail’, looped over from the end – as shown above. 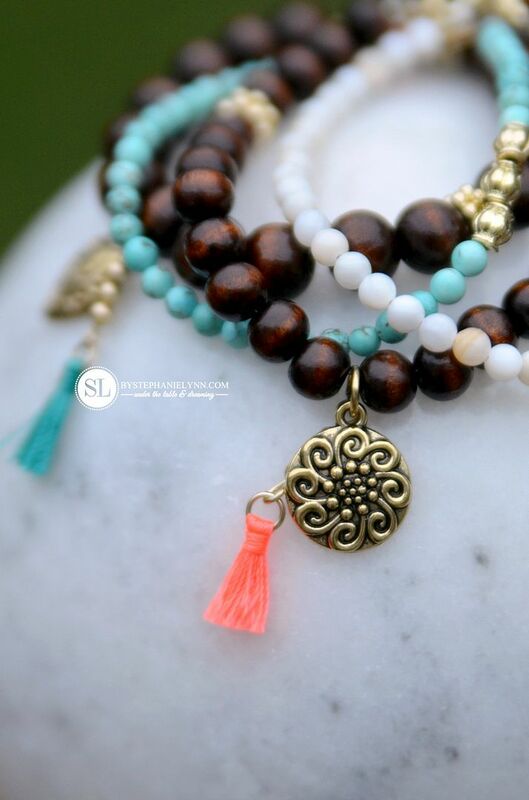 Step Six: Continue adding beads, along with any charms, to desired length. 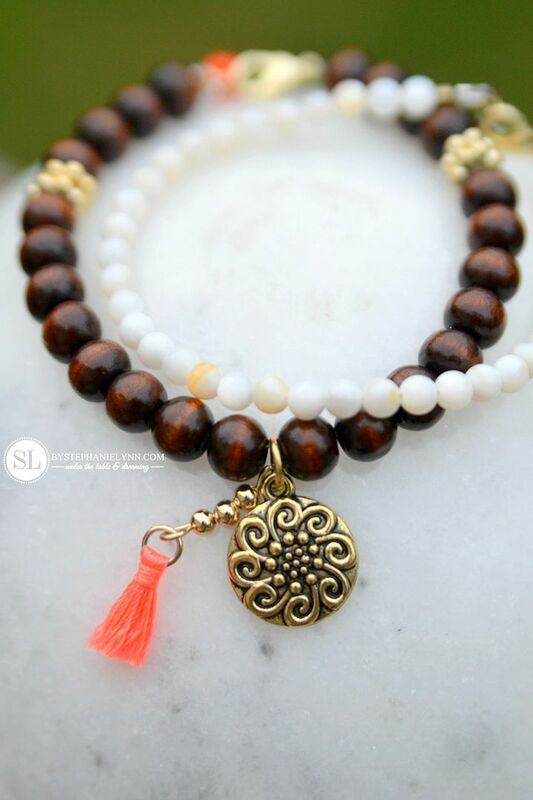 Charms and mini tassels were added to theses particular bracelets. 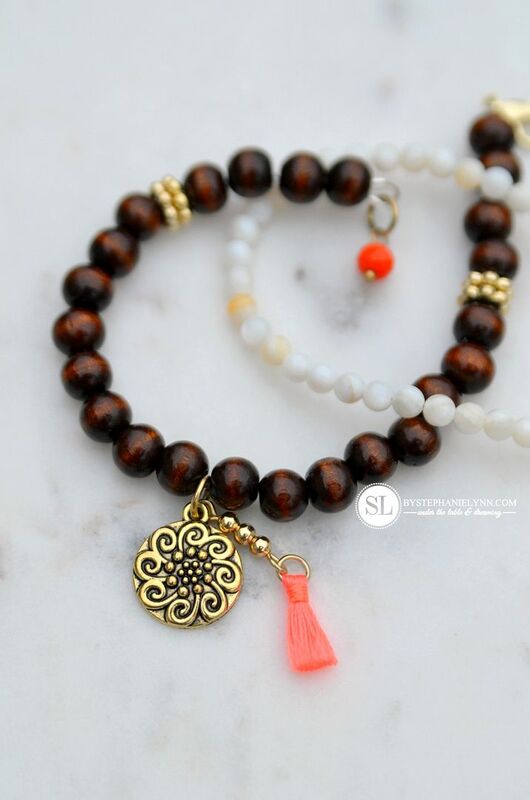 The pre-made Bead Landing mini tassels, found in-store, came with mini lobster clasps. 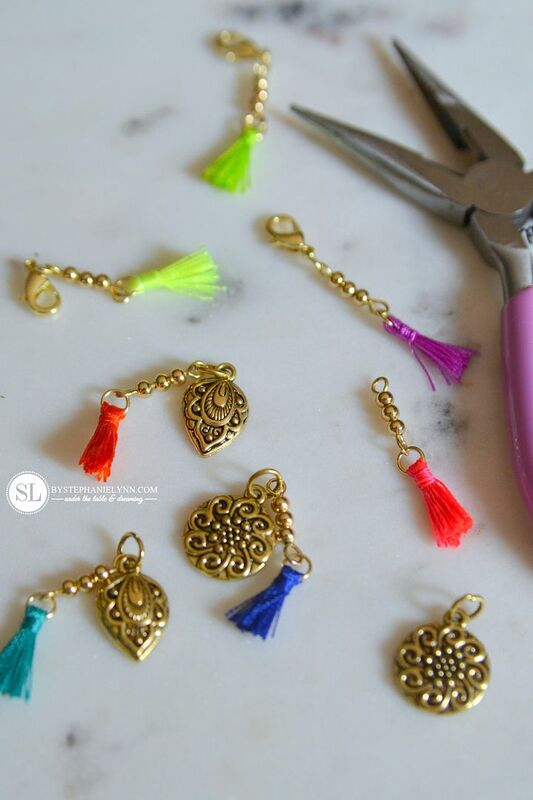 These were removed and the tassels were then added to a set of Bead Landing Charms, also found in-store. 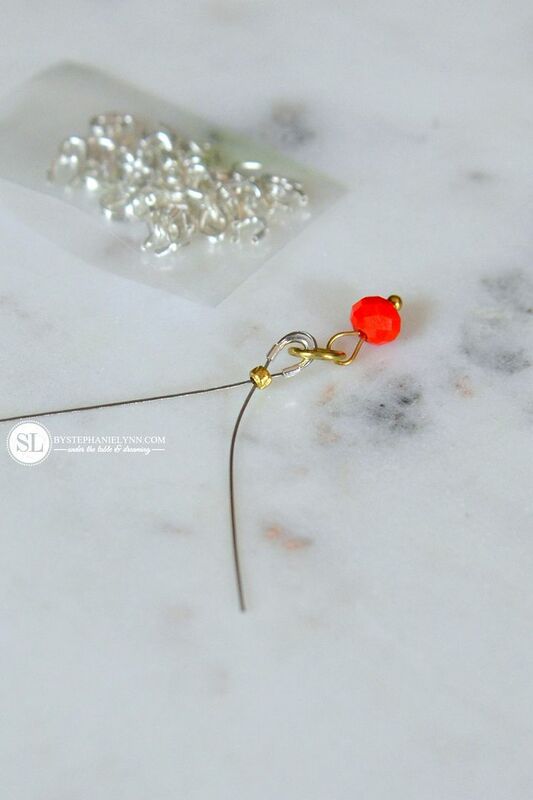 Step Seven: Thread on a Crimp Bead and the Closure. Step Eight: Loop the end of the wire back through the Crimp Bead and bind together using the Crimper Tool. 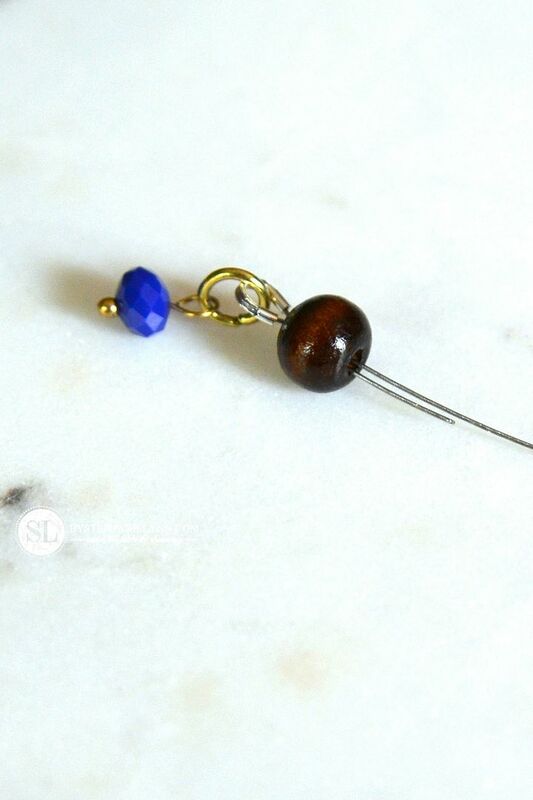 Step Nine: Thread the end of the wire back through a few of the beads for added security. Step Ten: Trim off the excess wire. 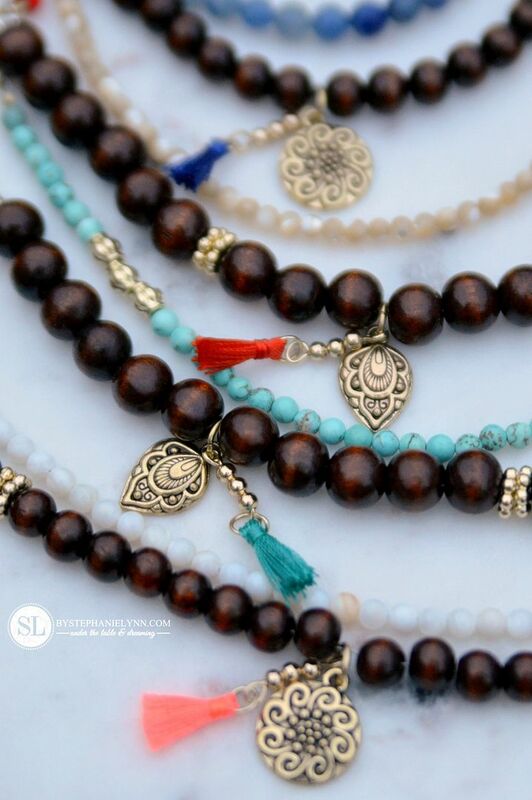 along with a few extra beaded bracelets for layering. Hope you are inspired to go and try something new this month. If anything, check out list of Michaels Classes and fun activities available near you. Many registrations are free with just the cost of your supplies. If you could learning a new creative skill – what would it be? This post is brought to you by Michaels . The opinions read here are entirely my own. Embrace your creativity by trying something new! Did you know that Michaels offers free classes in their stores? You can try out a new craft skill for just the cost of supplies. Another great way to explore your creativity is by trying out a craft kit. Michaels has everything from sewing kits to art kits and everything in between. Here’s to trying something new!